The World Gold Council (WGC), the market development organization for the gold industry, has released the latest issue of its Gold Demand Trends quarterly publication. 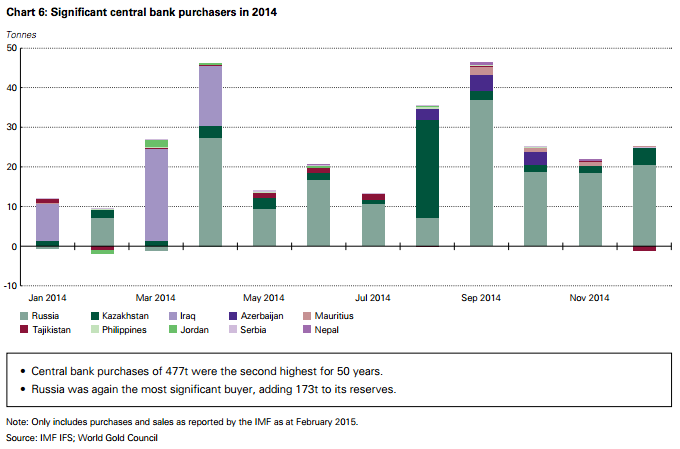 The report contains some eye-opening facts and statistics regarding gold investment demand, central bank buying, and production and supply in 2014. We’ve summarized what we believe are the most relevant points below. Q4 demand went from 930 tons to 987.5 tons, a growth of 6%. Total demand for 2014 was 3,923.7 tons, a drop of 4% from the year prior. The report points out that this drop was to be expected, since 2013 saw a record surge in consumer demand. The gold price in U.S. dollars was stable in 2014, with relatively low volatility. The gold price in euros rose by 14% over the year as the euro weakened against the dollar. The most significant rise in local gold prices due to weakened currency was in Russia (see our blog “A Russian coin dealer’s lessons on gold ownership” for more on this). Investment demand for gold in 2014 totaled 904.6 tons, 2% above the 2013 total. The perceived U.S. economic recovery and a stronger dollar limited gains in demand. Total bar and coin demand fell sharply, but it was in tough competition with 2013’s record levels. 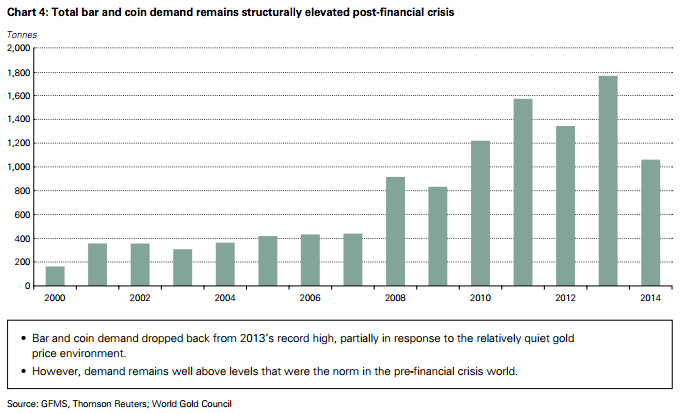 And as the chart above illustrates, bar and coin demand is still at much higher levels than before the financial crisis of 2008. “Seeking continued diversification away from the US dollar,” central banks bought 477.2 tons of gold in 2014 – 17% more than the 409 tons purchased in 2013, and the second highest year of central bank net gold purchases in the last 50 years. The number one purchaser of gold in 2014 was, you guessed it: Russia. Its central bank added 173 tons to its already large gold reserves, bringing its total holdings to an estimated 1,200+ tons. Gold now accounts for 12% of Russia’s overall central bank reserves, and Russian gold demand accounted for 36% of total central bank demand in 2014. Economic turmoil as well as the country’s continuing conflict with Ukraine were strong contributing factors. In other words, they believe it indicates miners may have reached a peak in gold production, and it’s all downhill from here. This is a sentiment that has been echoed by Goldcorp CEO Chuck Jeannes, as well as other mining executives. While gold had a relatively quiet 2014 in terms of its performance, a few indicators point to this possibly changing in 2015. The aforementioned mining difficulties and rampant central bank hoarding could dry up the global gold supply, leading to a rise in gold prices. Additionally, the European Central Bank has undertaken a massive money printing program, and there are concerns about the world being in a currency war. These economic woes have already driven safe-haven demand for gold, a trend which could very well continue. “Geopolitics, the perception of risk and even emotional risk from investors are the main drivers this year,” said Frederic Panizzuti, an executive of the Swiss refiner MKS, at the Richcomm Commodities Outlook in Dubai on Sunday. Call American Bullion at 1-800-326-9598 or request your Free Gold Guide to start diversifying and protecting your portfolio from this uncertainty with physical gold. If central banks do it, why shouldn’t you? American Bullion, Inc. specializes in converting your IRA, old 401k, or other qualified retirement plan to a self-directed IRA capable of holding physical gold coins and bars, known as a Gold IRA. We can also help you buy gold and silver or other precious metals outside of your retirement account through cash purchase for secure home delivery. We’ve pioneered a system to handle all the details for you, tax-free and hassle-free. As a U.S. Mint nationally listed dealer and a top-tier Gold IRA company, we ensure every transaction is fast and secure. See our American Bullion Reviews page for testimonials from our many satisfied clients.